Is the Thesis Theme Really That Good? 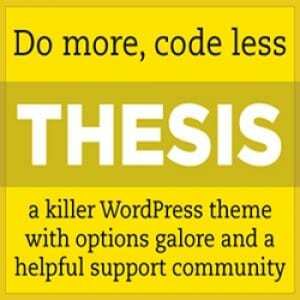 Thesis Theme is one of the most popular WordPress themes out there, and it’s not a surprise when you see all that it has to offer. The reason so many people like it is because it gives you boatloads more control than you have with a standard WordPress theme. Because of its level of customization, you can control the design and layout of your site pretty easily once you familiarize yourself with it. But just how important is your theme to your overall strategy, and is this one worth buying? In the land of WordPress themes you basically have your free ones, and your premium ones. The Thesis Theme falls on the premium side, which means it comes with a price, but the trade off is that you get a solid theme with no bugs, solid support, and consistent updates. Getting the theme right is one of the first keys to success as a website owner. It’s one issue you want to put to rest and not have to worry about anymore. You need something that can scale with you as your site grows, and something that you won’t be outgrowing when you it the tipping point. The claim of Thesis Theme is that it can help your website rank well, because it is coded in a way that makes it load quickly. They also say you can customize it easily, either through their OpenHook capabilities, or through their Theme Settings pages. This can include things like how many columns your site has, how wide each of these columns are, the header, the footer, and widget placements. The hype is that this theme is used by thousands of sites of all sizes, and several webmasters swear by it. There are also a lot of affiliates that praise the software, but are only trying to get you to buy it. To cut through this hype, you just have to try it out, because it’s the only true way you’ll know if it’s the right theme for your site. If you just want to run Thesis on your own personal site it’s $87, which is good for one domain. However, if you have several sites and want to run it on all of them, the developer’s license is $164. This allows you to use Thesis on as many sites as you want, even on sites you plan to flip or sell. You have to install this theme, but it installs just like any other. Once you’ve got it activated, you should play around with it for awhile to see all that it can do. Dedicate a full day to trial and error as you learn how to use it to its full capacity. There are tutorials available with a quick Google search, so if you want it to do something specific, just do a search and you’ll usually find someone walking you through the steps to do what you want it to. There’s not much to dislike about the Thesis Theme. At this point it has undergone a lot of updates, it’s solid, and there’s responsive support if you run into any trouble. There’s also tons of Thesis Theme experts out there that can help you make it do literally anything you can think of in regards to design and functionality. Once you get your site looking the way you want, you won’t have to worry if you need to make changes in the future, as it’s easy enough to edit. And since it’s WordPress, you can add all sorts of plugins to get the functionality you need, and thesis is widget friendly, so it’s easy to put them where you want them. Not to mention it also sets your site up pretty well in regards to it being SEO friendly, lightweight, and easy for your users to navigate and find what they want. One of the neatest features you’ll find is the ability to control what fonts your site uses, even for the header tags, so you can use things like Google Web Fonts and really make your site stand out from the crowd. One trick is to make your header tags be the same font that’s used in your logo. It connects everything together visually and really makes it look professional. We not only recommend the Thesis Theme, we use it to run this site. It’s pretty easy to customize it so you can have it look the way you want, and you can see the changes take effect immediately, so it’s a good way to try out different layouts, check your stats to see if your numbers are improving, and then revert back to the old design if your new one isn’t working. After you use it for a while, you’ll find it hard to go back to an ordinary theme, because you’ll miss the level of customization you get. In fact, if you find a design that you like, you can mimic it pretty closely just by using the different options you have in your Thesis dashboard. That way you get the design you want, with the flexibility you want. Try out the Thesis Theme and see how you like it. It comes with a 30 day money back guarantee, which is just enough time to try it out, put it through its paces and see if you’d like to stay with it or not. At this price point, there aren’t a lot of themes out there that provide the sort of features it does. What do you think? Does Thesis Theme work or not? Does the Forearm Forklift Really Help on Moving Day?